Can you tell the story of a region or a city from old postcards? 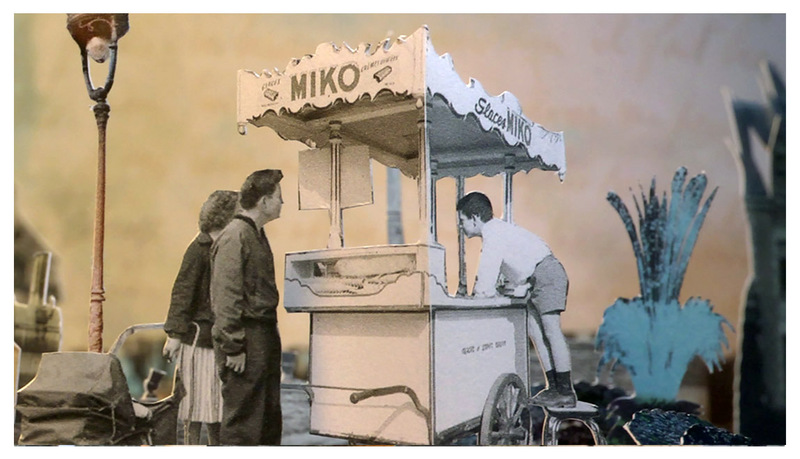 Such is the task la Bande Passante has set itself with the series of short shows entitled Villes de Papier / Paper Cities. 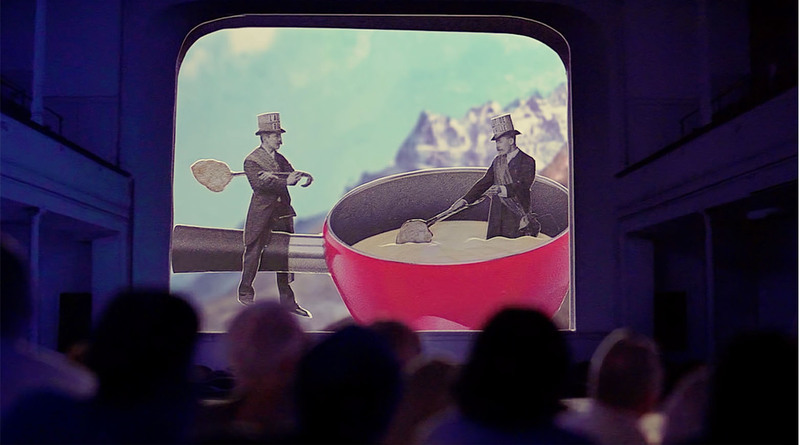 The artists create a performance based on postcards or photographs which have been cut up, folded and put into three dimensions, then animated with video, sound, lighting and sometimes text. Each “paper city” is unique, and informed by the local archives. Certain performances offer a version true to the town or city’s past, while others take a more fanciful approach. The audience rediscovers a European capital at the end of the 19th century, when a river flowed through it (Paper Cities: Brussels). We travel through a bygone Brittany with its architecture and costumes (Paper City: Pays de Pontivy). We follow the changes of a city from the Middle Ages to the present day (Paper City: Metz). We admire an imaginary village located beside a stream (Paper City: Oloron-Sainte-Marie). In Switzerland, we assist to a city’s construction, its festivals, and its theater on the shores of Lake Geneva (Paper City: Vevey). We stroll on the edge of L’Ille at the time of the washerwomen, old neighborhoods now disappeared, parks of the beautiful era (Paper City: Rennes). The landscape is built up and dismantled in front of the audience, rendering the passing of time perceptible. La Bande Passante designed and produced the first Paper City in late 2014, in partnership with the Musée de la Cour d’Or, the art and history museum of Metz. Benoît Faivre and Tommy Laszlo closely examined some 6,000 old postcards: documents which, to their minds, represent a collective memory and the traces of past societies and countless anonymous lives. They selected a series of images for their aesthetic value, their interest, quaintness or the emotion they evoke. By laying out this series of views, they created an urban area in which villages come to life during the performance. Seeking to rescue these neglected documents from oblivion, the two artists base their approach on the resources they happen to be working on in museums, media libraries and city or departmental archives. In this way, each short form is an independent, tailor- made creation. 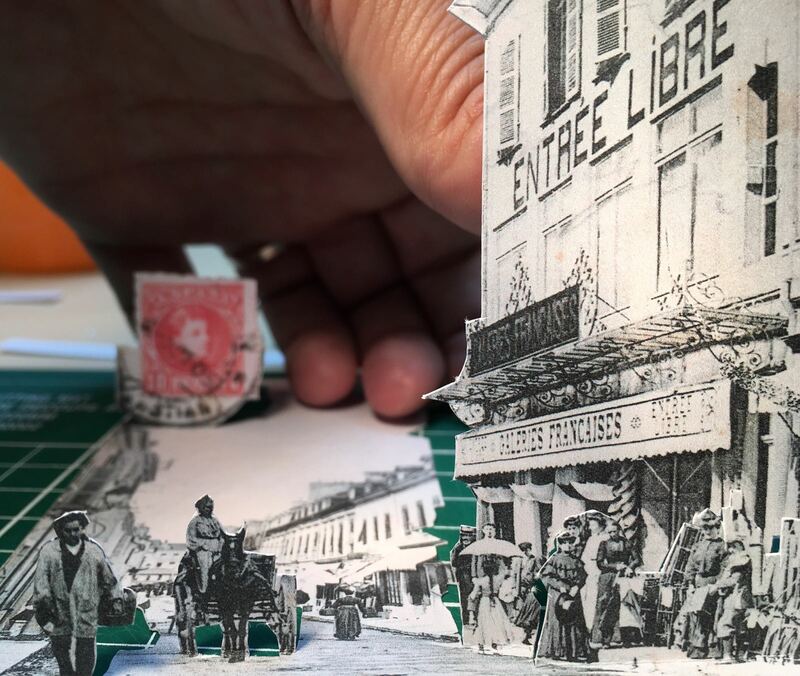 In their Paper Cities, Benoît Faivre and Tommy Laszlo enhance the heritage of old postcards with present-day tools. Without transforming the documents, they “augment” them on stage. Before our eyes, they cut up, fold and give form to these black and white reproductions, revealing streets, squares, gardens and car parks or building sites. This miniature landscape soon bustles with human activity thanks to a soundtrack which recreates the details of daily life in a particular place at that time. The artists also film the model in order to project it on a large screen. Travelling shots, panoramic views and close-ups create an illusion of depth and movement and immerse the spectator in a particular neighbourhood. Paper Cities gives the town the leading role in the performance. A true journey through time. 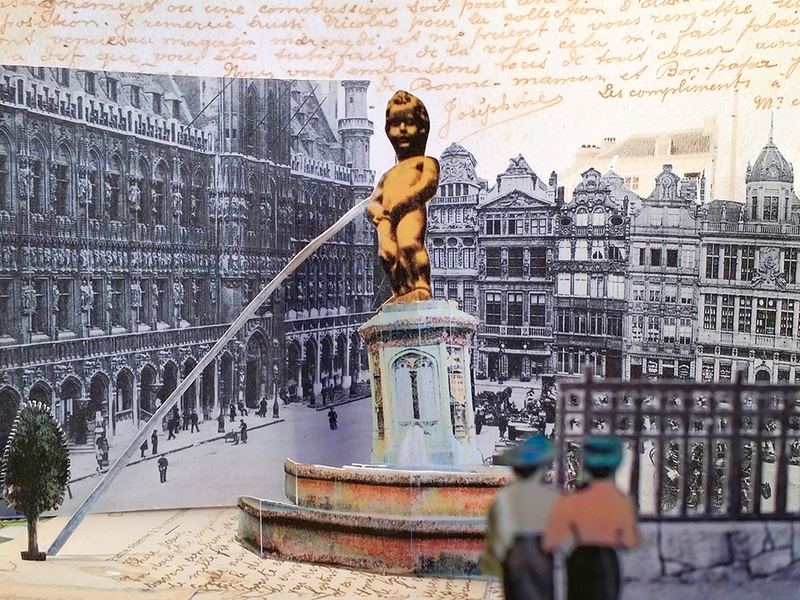 › Paper City: Rennes (2019) – In association with the Britain Museum, les Champs libres and Le Rheu city. 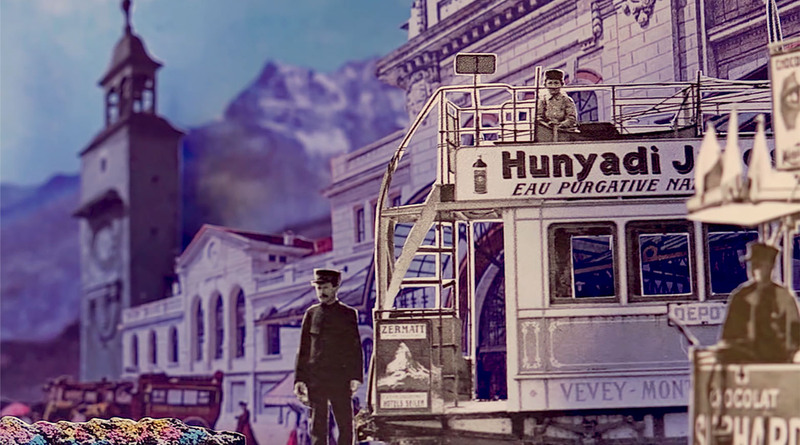 ›Paper City: Vevey (2018) Co-produced by Le Reflet Theatre of Vevey (Switzerland), in association with the Images Vevey festival. 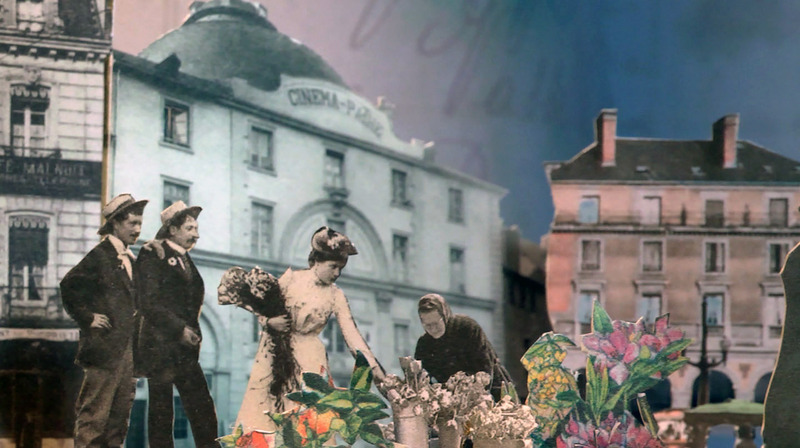 ›Paper City: Pays de Pontivy (2016) Co-produced by Mil Tamm, the Pays de Pontivy cultural project (47 municipalities of Centre Morbihan and Pontivy Communautés), in partnership with Le Carton Voyageur, The Baud Postcard Museum. 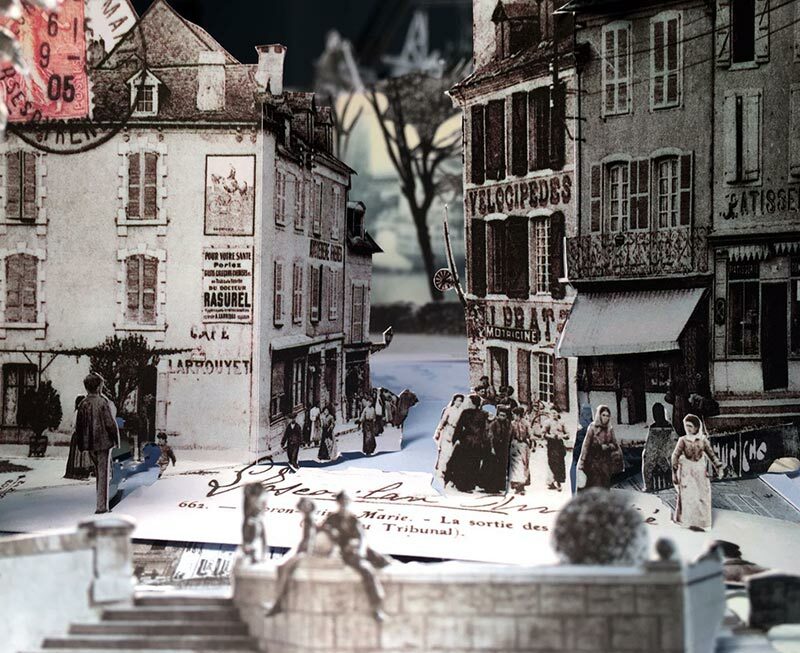 ›Paper City: Oloron-Sainte-Marie (2016) Co-produced by the municipal media library, the Heritage Department and Espace Jéliote, publicly-funded puppet theatre of Oloron-Sainte-Marie. 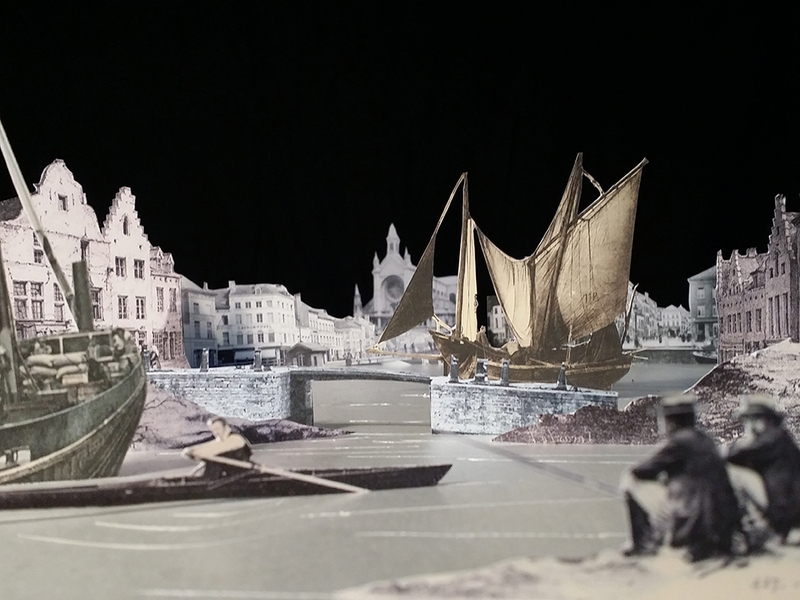 ›Paper City: Metz (2014) Co-produced by Moselle Arts Vivants, le Musée de la Cour d’Or, Metz Métropole. If you would like to create a customised Paper City from archive resources, we can do it! Contact us to organise a co-production with residency.